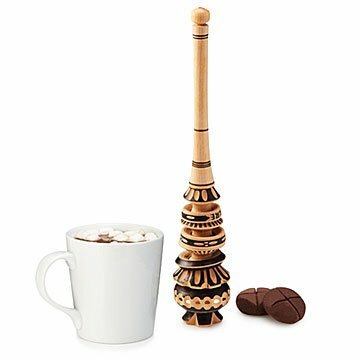 Take hot cocoa-making into your own hands with this traditional Mexican molinillo set. Nothing's more comforting than a generous serving of chocolate—except, maybe, a generous serving of hot chocolate. Make an extra special cuppa with this set: Melt one of the servings of chocolate goodness (there's two of them) or any other solid chocolate in milk, and use the traditional Mexican molinillo to whip up a froth on top. Simply place the molinillo between your palms, and rotate in the pot of hot chocolate for a cafe-worthy finished product. Jacquie Lewis and Jules Vertrees work with local artisans who make these by hand in Mexico. Jacquie Lewis and Jules Vertrees don't want to sell just stuff. So the mother and daughter team travels the world looking for authentic goods that make us want to have meaningful experiences together. Always curious about different cultures—and especially their cooking—they also want to celebrate the heritage of artists and communities we may never have the chance to encounter in person. "Fun, easy, practical, authentic, and respectful of the people who make the items," they say, "is the heart of our product philosophy." Wash molinillo with soapy water and air dry. Do not put in the dishwasher. Includes two servings of chocolate. Coupled this with high end hot chocolate. Lovely decoration to leave out all the time but especially fun to use. I was afraid to use it at first because it is so beautiful, but it is works really well and washed up perfectly. I will be using this for years to come.